Hardly a day goes by without something horrifying happening somewhere. It is impossible to turn on the television, or surf the internet without catching a glimpse that something god awful has happened somewhere. The image driven way in which we live means that we have been utterly desensitized to what we are seeing. It has no resonance. It creates no fear. As by and large it is so far away that we need not give it a second thought. Restitution, penance or whatever the hell you want to call it is a queer old bird. In the heyday of global awareness people used to do all manner of strange things to raise money for causes close to their hearts, nowadays, when the entire universe is a single click away, the most most people ever do is like or share a status on Facebook. They sleep easy feeling that they have pinned their colours to the mast, that they have done their bit, that they have changed or affected something. And it makes me sick. We are now living in the age of indifference, protected by the castle battlements which are the screens we use to communicate with each other, even when we are sitting next to each other on the bus, or at the dining table. It is an age in which people have truly lost the sense of their very selves, as these tiny screens provide people with a sense of safety which real life could never offer. The fact is that we now spend so much time staring at screens the vast majority of us are entirely unable to separate fact from fiction. It’s as if our indifference has made us imbeciles. A great example of the stupidity of people appeared on social media this weekend. On first impression it appears that this is an advert. 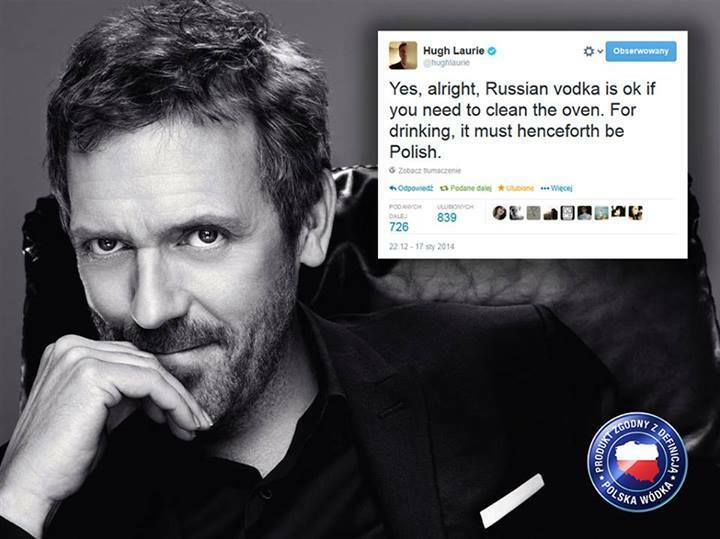 It looks as if Hugh Laurie is promoting Polish vodka, which is quite a reasonable supposition. After all it is stamped with a Polish vodka label. A media agency took the quote directly from Hugh Laurie’s twitter feed, stuck it onto the picture with the label and suddenly one simple tweet had become a marketing campaign. Many patriotic Poles proudly shared this picture without giving it a second thought. Why would they? After all, if it is on twitter it must be real, right? What if you took a peek on Twitter and merely looked at Hugh Laurie’s previous tweet? I’d boycott Russian goods if I could think of a single thing they made besides the rest of the world depressed. And what if you really went wild, and err took the time to look at the tweet before that? Suddenly the entire context of that single image has taken on an entirely different meaning. It was not a tweet promoting Polish vodka. It is not from an advertising campaign. It was a complaint, a reaction to Russia’s draconian persecution of gay people. It was a point worth applauding, worth celebrating which unfortunately was manipulated for an entirely different purpose. It is a sad example of what we have become. It should have been a rallying cry for people to stop and think about Sochi. To think about the persecution of gay people which is taking in place in Russia today. Now today. It could have been used to encourage people to boycott Russian products. To boycott Sochi sponsors products. To not turn on their televisions to watch the Winter Olympics. Instead it became a Facebook viral hit. Welcome to 2014. Please leave your brains at the door and prepare for take off.